Concerned Christians think about ecology at two levels. At the macro or theoretical level, we are asking whether our faith is more than a divine rescue plan to supernaturally airlift a minority of the human race to heaven. We are reviewing whether planet earth is more than a temporary backdrop for the drama of human salvation, and whether these “props for the play” will be discarded once the drama wraps up. But while these big theological issues are being hashed out, Christians are also asking a very practical question. How can we get started living greener (that is, more ethically responsible) right now in our day-to-day activities? Many concerned Christians know we are to steward the earth, and they want to help alleviate the crisis. They are trying to consume fewer goods, drive or fly fewer miles, use air-conditioning less frequently, and carefully recycle glass bottles and paper. These are all commendable initiatives. But then we read about some massive coalmine in Australia or Indonesia that produces enough coal every day to release millions of tons of carbon monoxide into the atmosphere, warming the earth and fouling the air. We think: What difference does it really make for me to leave a bit smaller carbon footprint? These bigger operations are the ones that really determine whether the world will be clean or dirty. I am just one little person who doesn’t matter. I might as well enjoy life as long as I can, and stop worrying about the earth. The proper Christian response to our “smallness” is not apathetic resignation. This responsibility is ours regardless of how the big picture unfolds. Ultimately for us it is a matter of obedience to God’s command and faithfulness to our calling, not an inference from our calculations of consequences. Ultimately, Christians must live a deontological ethic (because it is the right thing to do) rather than a consequentialist ethic (because this will certainly make everything right again). We must be prepared, if necessary, to act unilaterally. Then again, who knows when a single faithful life might also become an inspiration to others and start a more consequential movement? Once we have worked this out, and seen our responsibility clearly, we need practical advice about what we can do. Here’s an outstanding resource, which I am pleased to recommend. It comes from Blessed Earth, a Christian earth-keeping organization founded by Matthew and Nancy Sleeth. Both are prolific authors and passionate earth-keepers; Nancy has recently written Go Green, $ave Green: A Simple Guide to Saving Time, Money, and God’s Green Earth (Tyndale, 2009). It’s a book filled with very practical tips on how to live greener and more in harmony with nature. There are visually-pleasing chapters on everything from lawn and garden to transportation to food to entertainment—and more. It’s not judgmental or grinding either, but positive, joyful and upbeat. The author offers her suggestions as comprising a better way to live. Some environmentally-concerned Christians may respond: I care about the earth, but I don’t have the money to buy an all-electric Nissan Leaf, or have solar panels installed on my roof. Is there anything I can do that won’t cost me an arm and a leg? Answer: Yes! 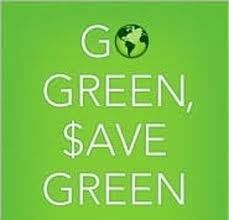 Go Green, $ave Green has been written for people with ordinary incomes who live within relatively strict financial parameters. The encouraging discovery here is that so much is possible without having to throw money around. Going green is not a privilege restricted to the two percent. It’s an option for all of us.